"Hring, Destroy the abode of the enemy" (29-30). O Auspicious One! I will now speak to Thee of Charu-karma, in order to insure the ritual success in those families in which the cooking of charu is a traditional practice in the performance of all rites (71). The pot for cooking charu should be made of either copper or mud (72). In the first place, the articles should be consecrated according to the rules prescribed in Kushandika, and then the pot of charu should be placed in front of the worshipper (73). After careful examination to see that it is without holes and unbroken, a blade of kusha grass of the length of a pradesha should be put in the pot (74). The rice should be placed near the square and then, O Adored of the Devas! the names of such of the Devas as are to be worshipped in each particular ceremony should be uttered in the dative case, followed by the words "to please Thee," and then "I take," "I place it in the pot," and "I put water into it," and put four handfuls of rice in the name of each Deva. He should then take the rice, put it in the pot, and pour water over it (75-77). O Virtuous One! milk and sugar should be added thereto, as is done in cooking. The whole should then be well and carefully cooked over the consecrated fire (78). And when he is satisfied that it is well cooked and soft, the sacrificial ladle, filled with ghee, should be let into it (79). Thereafter placing the pot on kusha grass on the northern side of the Fire, and adding ghee to the charu three times, the pot should be covered with blades of kusha grass (80). Then, putting a little ghee into the sacrificial spoon, a little charu should be taken from the pot. With it Janu Homa is done (81). Then, after doing Dhara Homa, oblations should be made with the Mantras of the Devas, who are directed to be worshipped in the principal rite (82). Completing the principal Homa after performance of Svishti-krit Homa, expiatory Homa should be performed, and the rite thus completed (83). In the sacramental and consecratory ritual this is the method to be observed. In all auspicious ceremonies it should be followed for the complete success thereof (84). After performing his daily duties and purifying himself, (the priest) should worship the five deities Brahma, Durga, Ganesha, the Grahas, and the Dikpalas (86). They should be worshipped in the jars on the East side of the square, and then the sixteen Matrikas namely, Gauri and others should be worshipped in their order (87). The sixteen Matrikas are Gauri, Padma, Shachi, Medha, Savitri, Vijaya, Jaya, Deva-sena, Svadha, Svaha, Shanti, Pushti, Dhriti, Kshama, the worshipper s own tutelary Devata, and the family Devata (88). let the husband touch his wife s head (103). Then the husband, surrounded by a few married women having sons, should place both hands on the head of his wife, and, after meditating on Vishnu, Durga, Vidhi and Surya, place three fruits on the cloth of her lap. Thereupon he should bring the ceremony to a close by making Svishti-krit oblations and expiatory rites (104-105). Or the wife and husband may be purified by worshipping Gauri and Shangkara in the evening, and by giving oblations to Sun (106). The wise one should then perform Briddhi Shraddha, and, as aforementioned, the ceremonies up to Dhara-Homa, and then proceed to the Pungsavana rites (119). The charu prepared for Pungsavana is called "Prajapatya," and the fire is called Chandra (120). One grain of barley and two Masha beans should be put into curd made from cow s milk, and this should be given to the wife to drink, and, whilst she is drinking it, she should be asked three times: "What is that thou art drinking,O gentle one?" (121). The wife should make answer: "Hring, I am drinking that which will cause me to bear a son." In this manner the wife should drink three mouthfuls of the curd (122). The wife should then be led by women whose husbands and children are living to the place of sacrifice, and the husband should there seat her on his left and proceed to perform Charu-Homa (123). Child, may thy life, vitality, strength, and intelligence ever increase (142). May Jahnavi, Yamuna, Reva, the holy Sarasvati, Narmada, Varada, Kunti, the Oceans and Tanks, Lakes all these bathe thee for the attainment of Dharmma, Kama, and Artha (149). O Waters! thou art the Pranava, and thou givest all happiness. Do thou therefore provide for us food in (this) world, and do thou also enable us to see the Supreme and Beautiful (Para-brahman). Water! thou art not different from the Pranava. Grant that we may enjoy in this world thy most beneficent essence. Your wishes arise of themselves spontaneously like those of mothers. Water! thou art the very form of Pranava. We go to enjoy to our fill that essence of thine by which thou satisfieth (this Universe). May thou bring us enjoyment therein (150-152). The wise one should sprinkle water over the child, with the three preceding Mantras, and then, as aforesaid, consecrate the fire and perform the rites leading up to Dhara Homa in the manner already described, and then should offer five oblations (153). He should make the oblation to Agni, then to Vasava, then to Prajapati, then to the Vishva-Devas, and then to Yahni under his name of Parthiva (154). Then, taking the son in his lap, the prudent father should speak into his right ear an auspicious name one that is short, and that can easily be pronounced (155). After whispering the name three times into the son s ear, he should inform the Brahmanas who are present of it, and then conclude the ceremony with Svishtikrit Homa and the other concluding rites (156). For a daughter there is no Nishkramana, nor is Vriddhi Shraddha necessary. The wise man performs the naming, the giving of the first rice, and tonsure of a daughter without any Mantra (157). In the fourth or sixth month after birth the Nishkramana Sangskara ceremony of the son should be performed (158). Brahma, Vishnu, Shiva, Durga, Ganesha, Bhaskara, Indra, Vayu, Kuvera, Varuna, Agni, and Brihaspati, may They always be propitious to this child, and may They always protect him throughout his going forth from the house (160). Ong, yonder is the Eye (of Heaven) who excels even Shukra in his effulgence, who is beneficent even to the Devas. May we see him a hundred years. May we live a hundred years (163). Having shown the Sun to his child, the father should return to his own house, and, after making offering to the Sun, feast his kinsmen (164). O Shiva! in the sixth or eighth month either the father s brother or the father himself should give the first rice to the child (165). After worshipping the Devas and purifying fire as aforementioned, and duly performing the ceremonies leading to Dhara Homa, the father should make five oblations to Fire, under his name of Shuchi, to each of the following Devas: He should make the oblations first to Agni, next to Vasava, after him to Prajapati, then to the Vishva-devas, and then the fifth ahuti to Brahma (166-168). He should then meditate upon the Devi Annada, and, after giving Her five oblations in Fire, place the son, adorned with clothes and jewels, in his lap, and give him payasa, either in the same or in another room (169). The payasa should be put into the child s mouth five times, uttering the Mantras for making oblations to the five vital airs; and after that a little rice and curry should be put into the child s mouth (170). The ceremony should be brought to a close by the blowing of conches and horns and other music, and by performing the concluding expiatory rite. I have done speaking of the rice-eating ceremony. I shall now speak of the tonsure ceremony. Do Thou listen (171). In the third or fifth year, according to the custom in the family, the tonsure of the boy should be performed for the success of the sacramental rites of the boy (172). The wise father should, after concluding the preliminary rites leading up to Dhara Homa, place on the north side of the Fire, called Satya, a mud platter filled with cow-dung, tila-seeds, and wheat, also a little lukewarm water and a keen-edged razor (173-174). and, after performing Shanti Karma and other rites, and making presents, bring the ceremony to a close (183). The sacramental rites from Garbhadhana to Chudakarana are common to all castes. But for Shudras and Samanyas they must be performed without Mantras (184). In the case of the birth of a daughter all castes are to perform the rites without Mantras. In the case of a daughter there is no Nishkramana (185). I will now speak of the Sacred Thread Ceremony of the twice-born classes, by which the twice-born become qualified for performing rites relating to the Devas and Pitris (186). In the eighth year from conception, or the eighth year after birth, the boy should be invested with the sacred thread. After the sixteenth year the son should not be invested, and one so invested is disqualified for all rites (187). The learned man should, after finishing his daily duties, worship the five Devas, as also the Matrikas, Gauri, and others, and make the Vasudhara (188). He should thereafter perform Briddhi Shraddha for the satisfaction of the Devas and Pitris, and perform the rites, ending with Dhara Homa, as directed in the performance of Kushandika (189). The boy should be given a little to eat; then his head, with the exception of the crown lock, should be shaved, and after that he should be well bathed and decked with jewels and silken clothes (190). The boy should then be taken to the Chhaya-mandapa, near Fire, under his name of Samudbhava, and there made to sit on a clean seat to the left (of his father or Guru) (191). The Guru should say: "My son, dost thou adopt Brahma-charyya?" The disciple should say respectfully: "I do adopt it" (192). The Preceptor should then with a cheerful mind give two pieces of Kashaya cloth for the long life and strength of mind of the gentle boy (193). Then when the boy has put on the Kashaya cloth, he should, without speaking, give him a knotted girdle made of three strings of munja or kusha grass (194). On that the boy should say, "Hring, may this auspicious girdle prove propitious"; and, saying this, and putting it round his waist, let him sit in silence before the Guru (195). This sacrificial thread is very sacred; Brihaspati of old wore it. Do thou wear this excellent white sacrificial thread which contributes to prolong life. May it be for thee strength and courage (196). "Yonder is the Sun," etc. (aforementioned) (199). After the boy has viewed the Sun, the Guru should address him as follows: "My Son! place thy mind on my observances. I bestow upon thee my disposition. Do thou follow the observances with an undivided mind. May my word contribute to thy well-being" (200). After saying this, the Guru, touching the boy s heart, should ask, "My Son! what is thy name?" and the boy should make reply: " . . . Sharmma, I bow to thee" (201). And to the question of the Guru, "Whose Brahma-chari art thou?" the disciple will reverently answer: "I am thy Brahma-chari" (202). The Guru should thereupon say: "Thou art the Brahma-chari of Indra, and Fire is thy Guru." Saying this, the good Guru should consign him to the protection of the Devas (203). "My Son! I give thee to Prajapati, to Savitri, to Varuna, to Prithivi, to the Vishva-devas, and to all the Devas. May they all ever protect thee" (204). The boy should thereafter go round the sacrificial fire and the preceptor, keeping both upon his right, and then resume his own seat (205). The Guru, O Beloved! should then, with his disciple touching him, offer five oblations to Five Devas (206) namely, Prajapati, Shukra, Vishnu, Brahma, and Shiva (207). When the oblations are offered into Fire, under his name of Samud-bhava, the names of each of the Devas should be pronounced in the dative, preceded by Hring and followed by Svaha. Where there is no Mantra mentioned, this method is to be followed in all cases (208). After this, oblation should be offered to Durga, Mahalakshmi, Sundari, Bhuvaneshvari, Indra, and the other nine regents of the quarters, and Bhaskara and the eight planets (209). The name of each of these should be mentioned whilst the offering of oblations is made. The wise Guru should then cover the boy with cloth, and ask him, who is desirous of attaining Brahma-charyya: "What is the ashrama thou desirest, my son! and what is thy heart s desire?" (210). The disciple should thereupon hold the feet of the Preceptor, and, with a reverent mind, say: "First instruct me in Divine Knowledge, and then in that of the householder" (211). Ong, let us contemplate the wonderful Spirit of the Divine Creator. May He direct our understanding, Ong. The Guru should then explain the meaning of the Gayatri (214-215). By the Tara, which contains the letters i.e., A, U, and M the Paresh is meant. He Who is the Protector, Destroyer, and Creator. He is the Deva Who is above Prakriti (106). This Deva is the Spirit of the three worlds, containing in Himself the three qualities. By the three Vyahritis, therefore, the all-pervading Brahman is expressed (217). He Who is expressed by the Pranava and the Vyahritis is also known by the Savitri. Let us meditate upon the sublime, all-pervading eternal Truth, the great immanent and lustrous energy, adored by the self-controlled; Savita, effulgent and omnipresent One, Whose manifested form the world is, the Creator. May Bharga, Who witnesseth all, and is the Lord of all, direct and engage our mind, intelligence, and senses towards those acts, which lead to the attainment of Dharmma, Artha, Kama, and Moksha (218-220). O Devi! the excellent Guru, having thus instructed the disciple, and explained to him the Divine Wisdom, should direct him in the duties of a householder (221). "My Son! do thou now discard the garments of a Brahma-chari, and honour the Devas and Pitris according to the way revealed by Shambhu" (222). Thy body is sanctified by the instructions thou hast received in Divine Wisdom. Do thou, now that thou hast reached the stage of a householder, engage thyself in thy duties appropriate to that mode of life (223). Put on two sacred threads, two good pieces of cloth, jewels, shoes, umbrella, fragrant garland, and paste (224). The disciple should then take off his Kashaya cloth and his sacred thread of black-buck skin and his girdle, and give them and his staff, begging-bowl, and also what has been received by him in the shape of customary alms, to his Guru. "Conquer the senses, be truthful and devoted to the acquisition of Divine Knowledge and the study of the Vedas, and discharge the duties of a householder according to the rules prescribed in the Dharmma Shastras" (228). Hring, Earth, Firmament, and Heaven, Ong. He should then himself perform Svishti-krit Homa, and then, O Gentle One! he should bring the investiture ceremony to a close by offering the complete oblation (229-230). Beloved! all ceremonies, from the Jivaseka to Upana-yana ceremonies, are performed by the father alone. The ceremony relating to marriage may be performed either by the father or by the bridegroom himself (231). The pious man should on the day of marriage perform his ablutions and finish his daily duties, and should then worship the five Devas and the Divine Mothers, Gauri and others, and making the Vasu-dhara do Briddhi Shraddha (232). At night the betrothed bridegroom, preceded by vocal and musical instrumental music, should be brought to the chhaya-mandapa and seated on an excellent seat (233). The bridegroom should sit facing the East, and the giver of the bride should face the west, and the latter, after rinsing his mouth, should, with the assisting Brahmanas, say the words "Svasti" and "Riddhi" (234). The giver of the bride should ask after the bridegroom s welfare, and ask also his permission to honour him, and upon receiving his answer should honour him by the offer of water for his feet and the like (235), and saying, "I give this to you," let him give the bridegroom the gifts. The water should be given at the feet and the oblation at the head (236). Articles for the rinsing of the mouth should be offered at the mouth, and then scents, garlands, two pieces of good cloth, beautiful ornaments and gems, and a sacred thread should be given to the bridegroom (237), The giver should make madhu-parka by mixing together curd, ghee, and honey in a bell-metal cup, and place it in the hand of the bridegroom with the words, "I give you" (238). The bridegroom, after taking it, should place the cup in his left hand, and, dipping the thumb and ring fingers of his right hand into the madhu-parka, should smell it five times, reciting meanwhile the Pranahuti Mantra, and then place the cup on his north. Having offered the madhu-parka, the bridegroom should be made to rinse his mouth (239-240). The giver of the daughter should then, holding durva and akshata, touch the right knee of the bridegroom with his hand, and then, first meditating on Vishnu and saying "Tat Sat," he should mention the name of the month, the paksha, and tithi, and then the names of the gotra and pravara of the bridegroom and his ancestors one by one, from the great-grandfather, beginning with the last, and ending with the father. The bridegroom s name should be in the objective, and the names of the others in the possessive case. Then follow the bride s name and the names of her ancestors, their gotras, etc. ; and he should then say: "I honour thee with the object of giving her to thee in Brahma marriage" (241-244). The bridegroom should then say: "I am honoured." The giver upon this should say, "Perform the ordained marriage rites," and the bridegroom should then say: "I do it to the best of my knowledge" (245). The bride, adorned with beautiful clothes and jewels, and covered with another piece of cloth, should then be brought and placed in front of the bridegroom (246). The giver of the bride should once again show his respect to the bridegroom by the present of clothes and ornaments, and join the right hand of the bridegroom with that of the bride (247). He should place in their joined hands five gems or a fruit and a pan-leaf, and, having saluted the bride, should consign her to his hands (248). At the time of consigning the bride the giver should, as before, mention his name twice in the nominative case, and should state his wish, and should also mention the names of the three ancestors of the bridegroom, with their gotras, all in the possessive case, as before. He should then mention the name of the bridegroom in the dative singular, and then the names of the three ancestors of the bride, with their gotras, etc., in the possessive case. At the time of mentioning the bride s name in the objective singular he should say after that, "The honoured, adorned, clothed, and Prajapati-devataka," and saying, "to thee I give," he should give away the bride. The bridegroom should, saying "Svasti," agree to take her as his wife (249-251). Let the giver then say, "In Dharmma, in Artha, in Kama, thou should be with thy wife;" and the bridegroom should reply, saying, "So I shall," and then recite the praise of Kama (252). It is Kama who gives and Kama who accepts. It is Kama who has taken the Kamini for the satisfaction of Kama. Prompted by Kama, I take thee. May both our kamas be fulfilled (353). The giver should then, addressing the son-in-law and the daughter, say: "May, by the grace of Prajapati, the desires of you both be accomplished. May you two fare well. Do you two together perform the religious observances" (254). Then both the bride and bridegroom, to the accompaniment of music and blowing of conch-shells, should be covered with the cloth, so that they may have their first auspicious glance at one another (255). Then gold and jewels, according to the giver s means, should be offered to the son-in-law as presents. The giver should then think to himself that the ceremony has been faultlessly done (256). The bridegroom either, on the same night or the day following, should establish fire, according to the rules of Kushandika (257). The fire that is made in this Kushandika is called Yojaka, and the charu which is cooked is called Prajapatya. After performing Dhara Homa in the fire, the bridegroom should offer five oblations (258). The oblation should, after meditation upon Shiva, Durga, Brahma, Vishnu, and the Carrier of Thunder, be made to them one after the other singly in the sanctified fire (259). Taking both his wife s hands, the husband should say: "I take thy hands, O fortunate one! Do thou be devoted to the Guru and the Devatas, and duly perform thy household duties according to the religious precepts" (260). The wife should then, with ghee given by the husband, and fried paddy given by her brother, make four oblations in the name of Prajapati (261). The husband should then rise from his seat with his wife and go round the Fire with her and offer oblations to Durga and Shiva, Rama and Vishnu, Brahmi and Brahma, three times to each couple (262). Then, without reciting any Mantra, the bride should step on a stone, and, standing thereon, the bride should take seven steps. If the Kushamdika ceremony is performed at night, the bride and bridegroom, surrounded by the ladies present, should gaze upon the stars Dhruva and Arundhati (263). Returning to their seats and seated thereon, the bridegroom should bring the ceremony to a close by performing Svishti-krit Homa and offering complete oblations (264). The Brahma marriage, according to kula-dharmma, in order to be faultless, should take place with a girl of the same caste as the husband, but she should not be of the same gotra, nor should she be a sapinda (265). The wife married according to Brahma rites is the mistress of the house, and without her permission another wife should not be married according to those rites (266). O Kuleshvari! if the children of the Brahma wife are living or any of her descendants be living, then the children of the Shaiva wife shall not inherit (267). O Parameshvari! the Shaiva wife and her children are entitled to food and clothing from the heir of her Shaiva husband in proportion to the property of the latter (268). 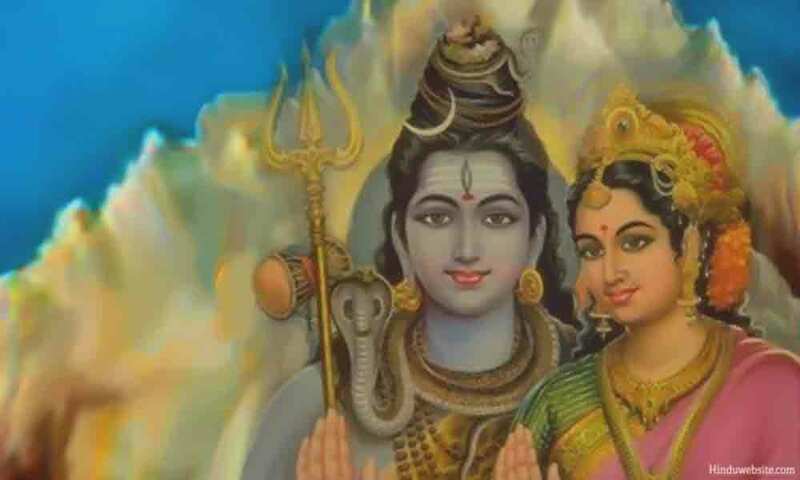 Shaiva marriage celebrated in the Chakra is of two kinds. One kind is terminated with the Chakra and the other is lifelong (269). At the time of the formation of the Chakra the Vira, surrounded by his friends, relatives, and fellow-worshippers, should, with a well-controlled mind, by mutual consent, perform the marriage ceremony (270). He should first of all submit their wishes, saying to the Bhairavis and Viras there assembled, "Approve our marriage according to Shaiva form" (271). The Vira should, after obtaining their permission, bow to the Supreme Kalika, repeating the Mantra of seven letters (Kalika Mantra) one hundred and eight times (272). O Shiva! he should then say to the woman: "Dost thou love me as thy husband with a guileless heart?" (273). May Raja-rajeshvari, Kali, Tarini, Bhuvaneshvari, Bagala, Kamala, Nitya, Bhairavi, ever protect thee both (276). The Lord of the Chakra should sprinkle them twelve times with wine or water of oblation, reciting the above Mantra. The two should then bow to him, and he should upon that let them hear the Vijas of Vagbhava and Rama (277). There is no restriction of caste or age in Shaiva marriage. By the command of Shambhu, any woman who is not a sapinda, and has not already a husband, may be married (278). The wife married for the purposes of Chakra in the Shaiva form should, in the case of the Vira who desires offspring, be released on the dissolution of the Chakra only after the appearance of her menses. The offspring of the Shaiva marriage is of the same caste as the mother if it be an Anuloma marriage, and a Samanya if the marriage is Viloma (279-281). These mixed castes should, at the time of their fathers shraddha and other ceremonies, give presents of edibles to, and feast the Kaulas only (282). Eating and sexual union, O Devi! are desired by, and natural to, men, and their use is regulated for their benefit in the ordinances of Shiva (283). Therefore, O Mahe-shani! he who follows the ordinances of Shiva undoubtedly acquires Dharmma, Artha, Kama, and Moksha (284). End of the Ninth Joyful Message, entitled "The Ten Kinds of Purificatory Rites (Sangskara)."